L'Ebreo / The Jew by Michelangelo Buonarroti the Younger. Over the years, my most startling discoveries were usually made while hunting for other things - in museums, libraries and archives in Florence. L'Ebreo / The Jew is a five-act comedy from 1613, written by Michelangelo Buonarroti the Younger - great-nephew and namesake of the celebrated sculptor, painter and architect. Featuring a Jewish character - Melchisedec - in the title role. Melchisedec and I crossed paths in the archive of the Casa Buonarroti - the sumptuous home of the artist's descendents and the inner sanctum of the cult of the Divine Michelangelo. But what was Melchisedec doing there? And what was I doing there? The Bust of Michelangelo the Elder, over the main entrance. Michelangelo the Elder (1475-1564) never actually lived in the Casa Buonarroti that we know today - but its creation was a near obsession for many years. 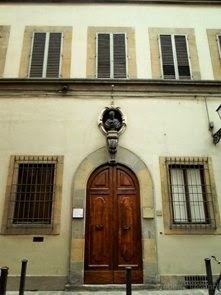 In 1508, he acquired four simple dwellings in his old neighborhood of Santa Croce and a fifth property in 1514. He lived in two of these houses - rather modestly - from 1516 until 1525, when he moved nearer to his work in the Basilica of San Lorenzo. Then in 1534, he left for Rome - where he remained until his death three decades later. The Casa Buonarroti, in the nineteenth century. This venerated artist did not set foot in Florence again (unless we count his burial there in 1564). But he was intensely aware of his social and economic status in his hometown - after a threadbare childhood in a proud but impoverished household. 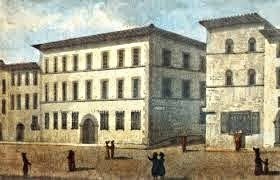 In his letters from Rome, to his brothers and eventually his nephew Lodovico (1519-99), he talked incessantly about property and possessions - especially his desire for "una casa onorevole in città" (an honorable family residence in the city). 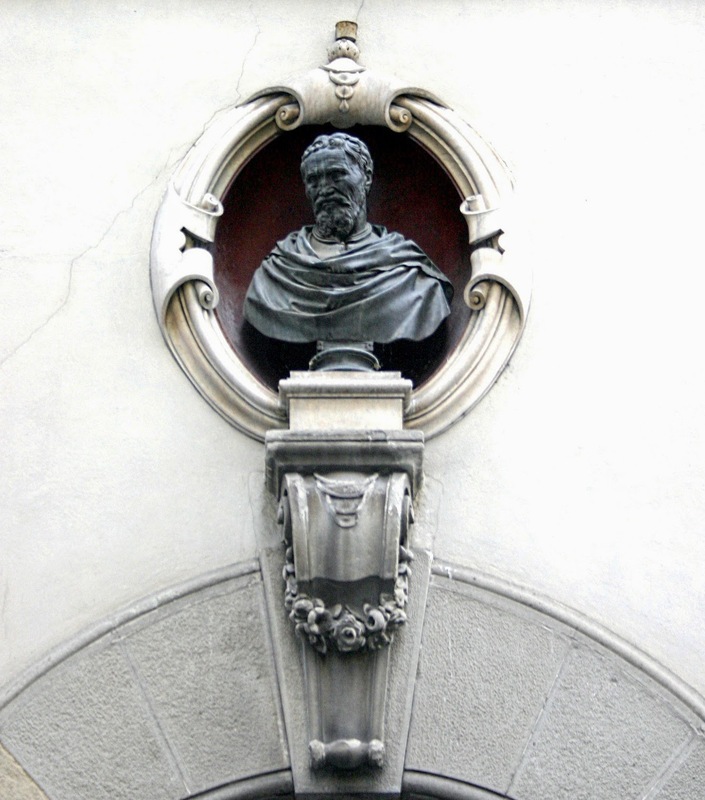 Casa Buonarroti: Giuliano Finelli's marble bust of Michelangelo the Younger. Michelangelo made more than enough money from his artistic endeavors, but the house project did not get under way until the time of Leonardo's son, Michelangelo the Younger (1568-1647). Construction continued for many years. 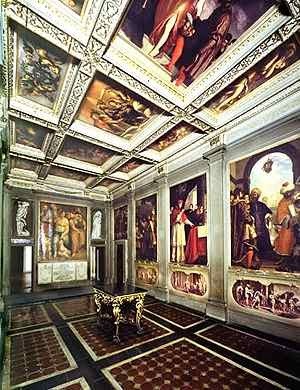 And from 1612 to 1643, Michelangelo the Younger realized four grand rooms on the piano nobile, richly decorated with real or imagined scenes from the life of his revered ancestor - employing the most distinguished painters and sculptors in Florence in those years. the life of Michelangelo the Elder. (central scene), by Domenico Passignano. 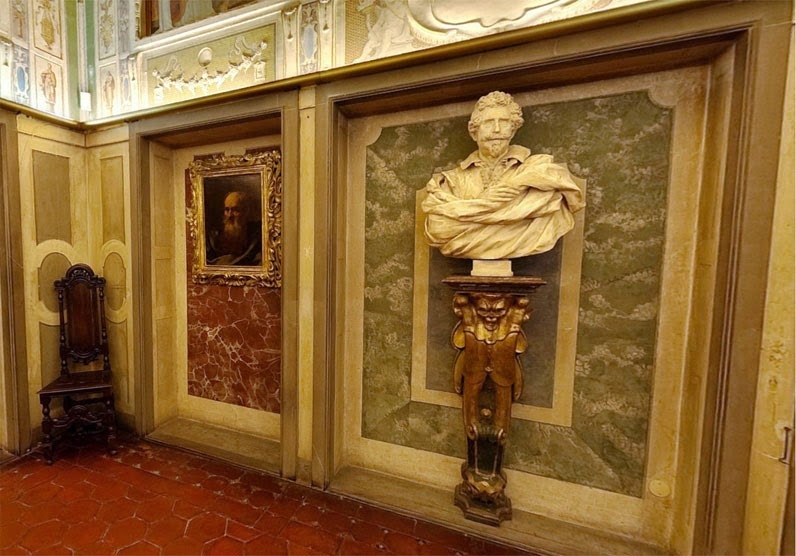 Michelangelo the Younger also assembled a splendid art collection, featuring drawings and sculptures by his great-uncle. 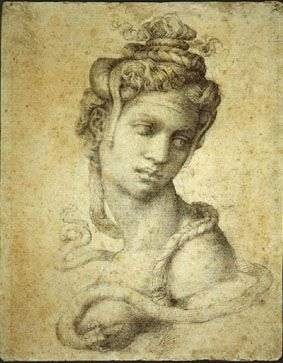 Cleopatra, a drawing by Michelangelo (Casa Buonarroti). 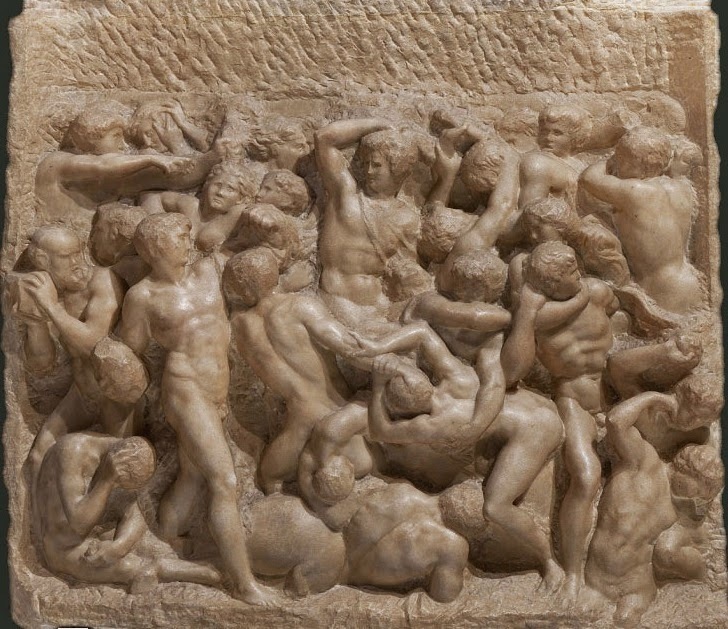 The Battle of the Centaurs, a marble relief by Michelangelo (Casa Buonarroti). There are many good reasons to visit the Casa Buonarroti: Intimate but lavish interiors... Unique works of art... And a sense of privileged access to Michelangelo the Man (not to mention, Michelangelo the Myth). Remarkably enough, the Casa also offers peace and reflective calm. We are talking about the most aggressively hyped artist in Italy and possibly the world - but somehow, his family home remains above the fray. A view in the Casa Buonarroti. 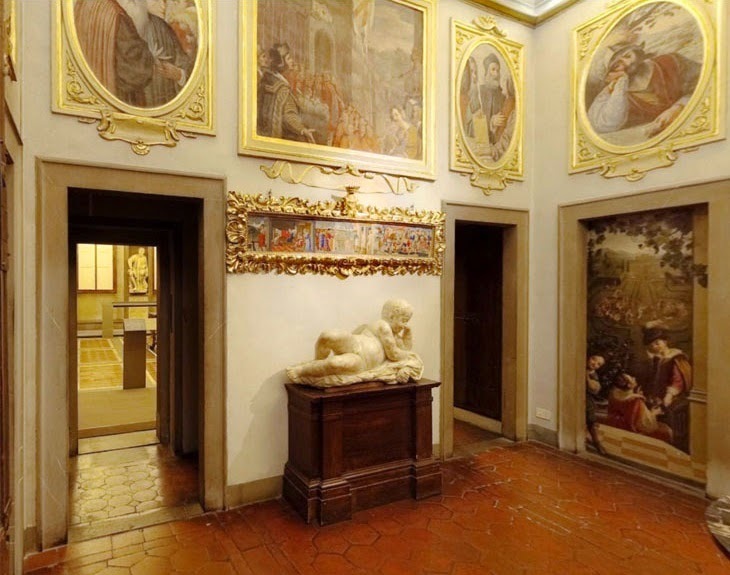 But meanwhile, on the upper floors, we can find a whole other Casa Buonarroti - an international center for scholarly research, hosting a famed collection of drawings, a specialized library of over 11,000 volumes and the historic archive of the Buonarroti family. The Library of the Casa Buonarroti. Today, Michelangelo the Younger is best known as the creator of the Casa Buonarroti and a tireless promulgator of the cult of the Divine Michelangelo. During his own lifetime, however, he was celebrated primarily for his literary work. Michelangelo Buonarroti the Younger was - in fact - the most successful and prolific Florentine playwright of the late Sixteenth and early Seventeenth Centuries. He was also an ubiquitous figure at the Medici Court. 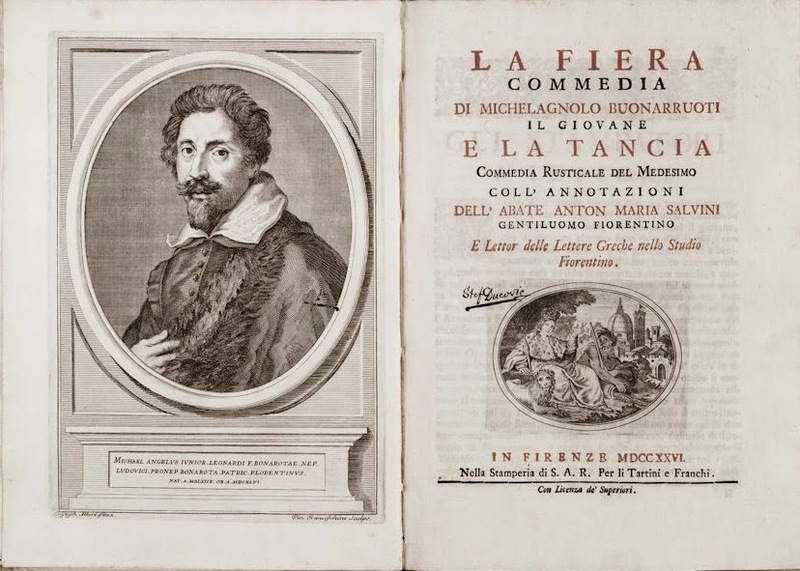 1726 edition of La Fiera and La Tancia, two comedies by Michelangelo the Younger. L'Ebreo / The Jew is one of his least-known but most intriguing plays - and I will be sharing the story of its discovery in my next posts. by Michelangelo Buonarroti. List of Characters. More about L'Ebreo / The Jew? If you have not yet visited , you should. It is one of Florence's most fascinating and evocative "secret places"!